You'd be forgiven for thinking it is only Virtuemart for Joomla, as it is what most recommend when talking about online shopping and Joomla, but there are other options and they are all worth looking at. 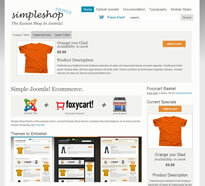 Foxycart is a good option to look at and while you JoomlaPraise fits it like a glove. The theme comes with one two or three columns, whatever width you want, eleven module positions and pretty much any font you want (of the ones they have included). JoomlaPraise have also included some other stuff with the theme which basically just means it is well worth it, as an online store or just as a Joomla theme.